This past Friday the first of four kokanee salmon give-aways was held at the Roaring Fork Judy Hatchery in Almont, Colo., just outside of Gunnison. My friend Janet Mossburg and I decided to take the trip from Glade Park to Gunnison the day before, fortunately her daughter lives in Gunnison so we had a place to stay. The give-away was timed for 9:00 a.m., Friday morning, but we were advised by some locals to get there around 5:30-6:00 a.m. We arrived in line about 5:45 a.m., and had 12 cars in front of us, they had been sleeping in their vehicles. By the time the gates were opened, we had about 100 cars behind us. We were informed they had about 3,000 fish to give away and were starting with 10 fish per person with our fishing license (we could also go to the end of the line and run through again). What an interesting venture, but I think one time is enough! We met Dan Brauch, the Fish Biologist for the Gunnison area and found out some very informative information on the Fish Hatchery and the kokanee salmon. The Hatchery was purchased by the Division of Wildlife in 1963 and in 1966 when they began to rear the trout eggs, the name “Roaring Judy” fish hatchery was given by the Gunnison school children. Fishing for kokanee salmon in Colorado depends on collecting spawn from mature kokanee, about 3- to 4-years-old this happens at several locations in the state, but as all Pacific Salmon, the fish will die soon afterward. To enable the public to make use of a resource that otherwise might be wasted, Colorado Parks and Wildlife conducts salmon giveaways at spawn-taking stations through the fall. 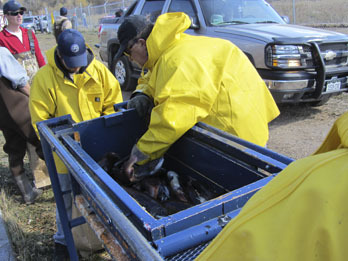 People must have a valid Colorado fishing license to receive salmon, and the giveaways are subject to the availability of fish. Division of Wildlife personnel spawn the salmon at the hatchery, taking 3,000,000 to 10,000,000 eggs per year. These eggs are put into the Hatchery through the winter with regulated water running over them. In the spring they are put into the outdoor holding tanks until they become about 2-inches long and are then returned to the river waters or trucked to the other reservoirs. • Roaring Judy hatchery: October 28 and Nov. 4. Be in line by 9 a.m. For more information, please call (970) 641-7070. • Vallecito Reservoir in Bayfield, Colo., at the community center on northwest side of reservoir 3 p.m. on Oct. 28 and Nov. 4 and 11. For more information, please call (970) 247-0855. • Dolores River, Joe Rowell Town Park in Dolores, Colo., 3 p.m. on Oct. 27 and Nov. 3 and 10. For more information, please call (970) 247-0855. • Williams Fork Reservoir near Parshall Colo., Oct. 24, 31 and Nov. 3. For more information, please call (970) 725-6200. • Shadow Mountain in Granby, Colo., Nov. 7, 10, 14, 17, 21 and 28. For more information, please call (970) 725-6200.